It is now 10:32 AM ET Time on Sunday, April 21, 2019. Currently there are 91 entrants. LOCATION & COURSE: Foster Lake is a scenic reservoir located just off U.S. Route 20 east of Sweet Home, OR. The course is a ¼-mile length of cable surveyed & certified accurate to USMS standards. Water temperature on this weekend in June has varied from 66-71 degrees Fahrenheit and will be posted at the event. ELIGIBILITY: Open ONLY to 2017 USMS members or foreign equivalents. Eligibility will be automatically verified through the online entry system. 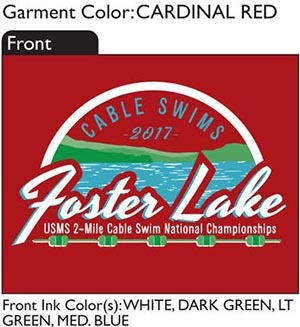 USMS “One-Event” membership is available for adults for $21. One-Event members are not eligible for the Two-Mile National Championships, but may swim in a separate non-championship category. Category I suits are required for the Two-Mile National Championship Swim. Category II suits—including wetsuits—are not allowed in the Two-mile Swim, but are welcomed in the One-Mile Swim and scored separately from Category I suits. Swimmers wearing Category II suits are not eligible for records. TIME LIMIT: Swimmers who cannot swim one mile in 45 minutes or two miles in 1:35 should NOT enter this event; swimmers on the course after these time limits may be stopped and listed as DNF in the results. REGISTRATION—ONLINE ONLY: All entries MUST be received by June 15, 2017. Due to organization & seeding needs, late or day-of-race entries will NOT be accepted (except for relays, see below). Please don’t even ask. ENTRY LIMITS: The entire event—including both swims—is limited to the first 200 registrants. We will maintain a waiting list in case early registrants drop out early enough to notify others. OMS SANCTION SURCHARGE: There is a required $5 per swimmer surcharge cover the cost of USMS-mandated sanction insurance. MEALS:Swimmers will receive a post-swim meal; order vegetarian or meat with entry. Swimmers may pre-order specatator meals (vegetarian or meat) for $10 each with entry. Online Registration closed on 6/15/2017.